Yesterday, I was wandering aimlessly in the mighty corridors of National Museum, New Delhi. I had gone there to attend an event, but had some free time on hand, so couldn’t resist taking a dekko at the artifacts. There were some busts, old sculptures and masks placed strategically in the middle lane. As I moved from one piece of art to another, I was stuck dumb with a huge, round shield like structure, labeled as a coin! 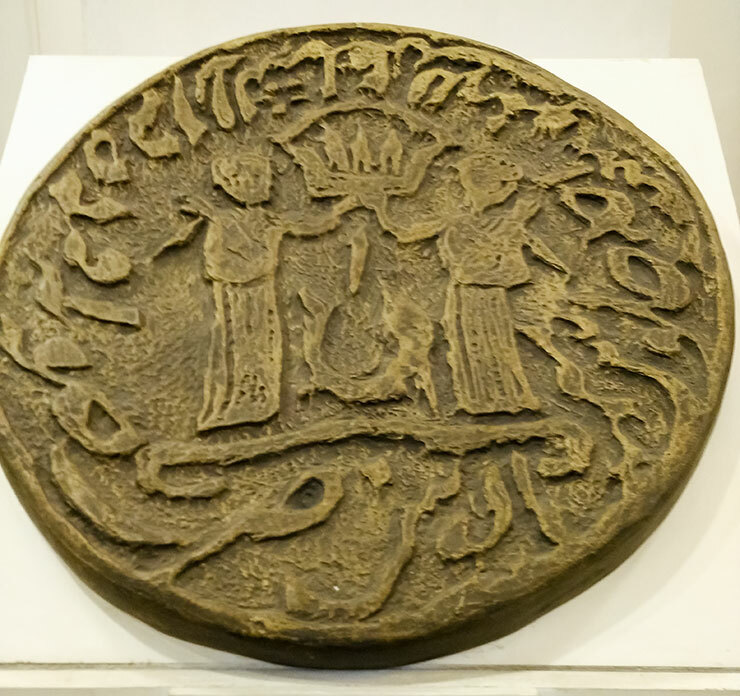 The supposed coin is 23 inches in diameter and 2 inches thick. It was, as you can see in the pictures above, referred to as a coin of Awadh, belonging to the reign of Mohd Ali Shah during 1837-42 AD. I have never seen such a huge coin before, and after my visit, tried to find out a little more about it and ended up reading a lot of interesting stuff. On first look, the coin does look impressive as well as intriguing. It has a peculiar kind of motif. If you look closely, one can easily make out the structure of a Fish with a crown above. 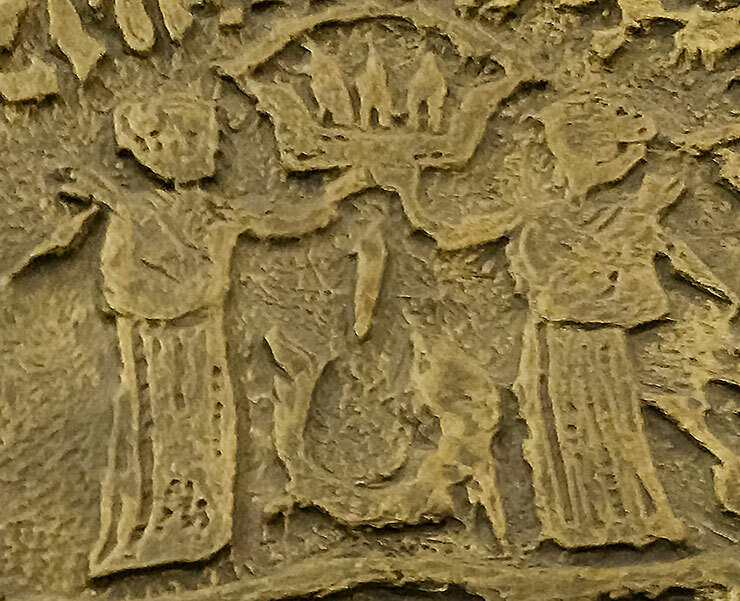 There are two prominent figures in standing position, presumably balancing the Crown. The calligraphy on the periphery of the coin is bold and clear, though I couldn’t make out as to what is inscribed there. As I continued with my search online, many lesser known facts unfolded. Apparently, the Nawabs of Awadh were not Kings in their initial days. In 1720, Mughal Emperor Mohd Shah had appointed Saadat Khan, an adventurer as the Subedar of Awadh. In 1739, as he died, his son was declared the Governor, and gradually Avadh became an independent kingdom under Mughal sovereignty. However, they had no Royal Emblem or title to boast of and had rather modest beginning. It was only in 1819, when East India Company persuaded the Avadh Nawab to declare himself as a King, that he finally attained the title of Badshah! The opulence of Awadh had always been top-notch, and now as the Nawab got East India Company’s support, Royal Insignia, Seal as well as the Crown, came into existence with heavy Western influence. A symbol of two fishes with a Kataar in between and a Crown above was adapted as the Royal Emblem. It was flanked by two tigers, each withholding a flag. In some versions, the tigers are replaced by Angels or Mermaids as well. The Royal Flag also depicts a fish and a crown. The “Fish” is a prominent feature of Avadh Royalty, as they proclaimed themselves as “Mahi Muratib” the ‘Order of the Fish” or Fish Dignity (in Persian or Arabic). The Emblem signified youth, bravery and strength and was originally founded by King of Persia, and later on adapted by Mughals as well as Avadh Nawabs. As I kept on reading, I could see the Rise and Fall of Avadh, playing before my eyes, with the Coin as the focal center piece. 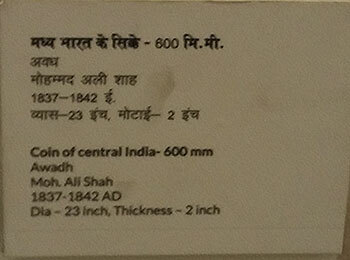 My search for finding out why and how such a huge coin, was used by any Kingdom, introduced me to a rich but not so well documented reign of Awadh Nawabs. To make matters even more intriguing, the symbol of two fishes continues in the State Emblem of Uttar Pradesh Government as well! In the present day UP logo, two fishes are separated by two wavy structures, symbolizing the confluence of Ganga and Jamuna Rivers. Here, the fishes and waves may be seen as a continuation of Avadh Royalty, with roots in Persia or it may be interpreted as the Buddhist symbol signifying freedom from restraints. But, one thing is certain, the fishes have become synonymous with UP state, despite the fact that it is not a staple diet there, as in Bengal or Orissa. Coming back to the Artifact, I still don’t know, whether it is a regular coin or the original Blue Print/Model used for minting of coins or if it is a limited edition coin, issued to commemorate some special occasion. I am unable to read what is written on the coin and my knowledge is limited to the small label put up by the National Museum Authorities. However, one thing is certain, I loved this rendezvous with the Royal Coin sitting pretty among the huge collection of busts and artifacts in the open corridor of National Museum in New Delhi. Scintillating indeed….